Understanding how competition fares is part of a winning mobile strategy. 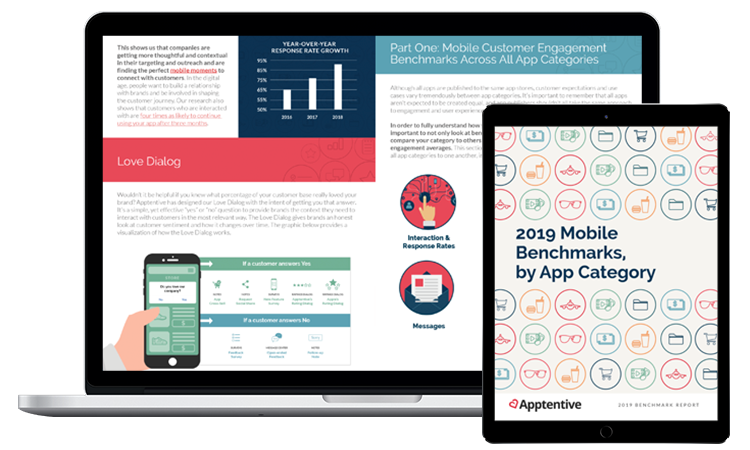 This report shares an industry-specific view of 2019 mobile app benchmarks by looking at how each app category compares and competes with the others. This report looks at how engagement metrics impact an app’s discoverability, loyalty, and retention rates by drilling down into app store category specifics. In the first half of the report, we look at how apps in each category stack up to the others. The second half of the report goes deep into data focused on individual app categories, along with tips on how app publishers can improve based on their industry. Data included is from over 800 unique Android and iOS apps in the Food and Drink, Travel, Finance, Shopping (Retail), Media, and Lifestyle categories, from January 2018 to December 2018.